(Revisited) Wireless Audio with Trends Audio TA-10The Trends Audio TA-10.1 amp powered by 12V battery, no AC connections period! 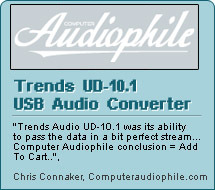 Trends Audio TA-10.1 playing 30 year old Polk Audio 7'sUsing Trends Audio play audiophile CD. Trends TA-10.1 Class-T amp. crossover with iPhone/iPod !